The bank that Ed Maas (James Franco) works in becomes a target to a group of bank robbers. The group is run by Vee (Taryn Manning) and Leah (Francesca Eastwood) who simply wants to get the money and get out. Things take a turn though when they find the vault has less money in then expected. Cue Ed Maas informing the robbers that the main vault is below the bank and it contains a substantial amount of money. The robbers will want to get their hands on the money inside but down in the darkness something lurks...waiting. 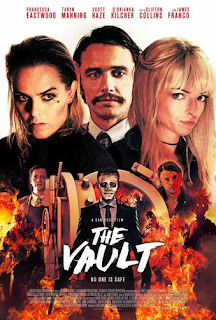 THE VAULT starts off as a standard bank heist movie that soon turns into a supernatural thriller, with a few moments of originality that is sadly missing in the past few years of big name starring movies. The film is also very much about the drama amongst the group of robbers as some are family members, notably Vee and her estranged sister Leah. Some may argue that the characters haven't got a lot of depth to them but considering how many characters are in this film it would have to be nearly 3 hours long to fit all their backstories in. This would bring the pacing of the film and its narrative to a grinding halt. While James Franco's role is minimal he plays a pinnacle part of the film as a whole. In summary, THE VAULT is a thrilling supernatural film that is fast paced and will keep you gripped right up to its explosive finale.